A cursive handwriting program for students K5 and up. One Mom’s Experience: “The Joy of Handwriting is an excellent resource to teach your child how to write in cursive. What I found especially helpful was that the author of this product didn’t just produce lots of worksheets for children to copy but uses very descriptive analogies to help a child in the formation of the letters. This is a all inclusive well rounded approach with flash cards to introduce the cursive letters, an explanation of how to write the letters in the right way, practice worksheets and even directions on how to teach cursive to different ages (and we know as parents that this is important). The Joy of Handwriting was born when Joy couldn’t find a program that satisfied her. She took the best methods and ideas she felt were the best and developed a program that is high quality and easy to use with kindergartners as well as older elementary students. After having such good success with her own kindergarten student, she wanted to make it available for others to try. The program was originally developed for cursive handwriting, but updated with this manuscript version. 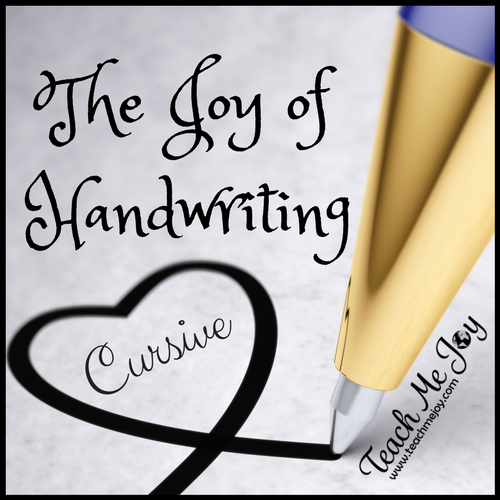 There are many websites that discuss the pros of teaching cursive handwriting first. There are also a few different programs that teach cursive to beginning writers. Joy has taught both printing and cursive and believes that teaching cursive first is the best way to go. 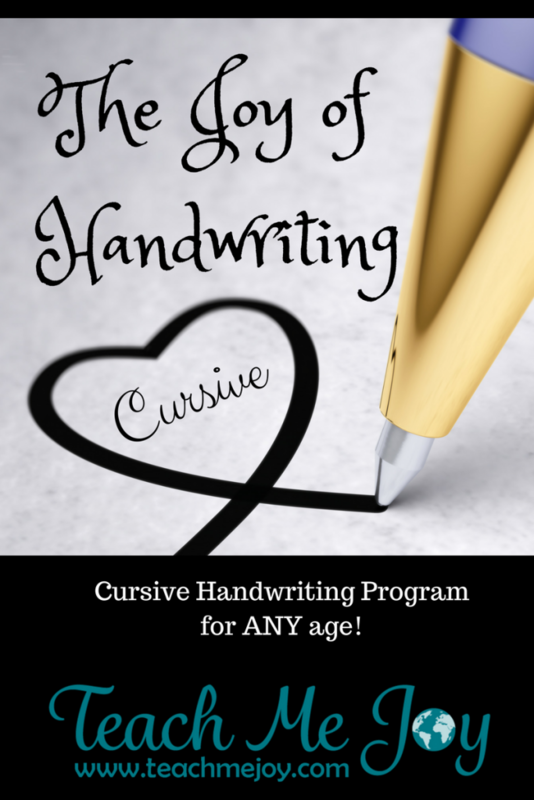 Cursive makes sense to children and is often used by therapists with children that have learning disabilities. The National Institute of Learning Disabilities is one of the organizations that use cursive for all levels. This program uses a simple writing style without tags and embellishments that some types use. It uses smaller lines which promotes better eye-hand coordination. You will find it is also easier for young children to stay in the smaller lines, regardless of the way other programs promote large lines. The program uses an outlined letter instead of dotted lines, which allows the child to writes the letter inside the lines. This is a perfect way to promote recognition and memory when learning to form each letter. Each day’s lesson is on ½ sheet of paper so the student will not feel overwhelmed. Set of flashcards showing the letter on one side and teaching helps on the other. Blank “Story Pages” that include a picture and a place to write a story or just practice. Draw and Write Page – Page that includes a space to draw your own picture and write a story or sentence. 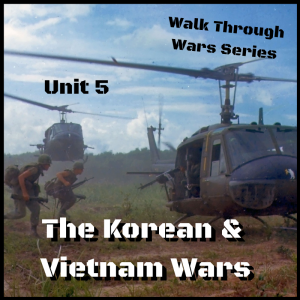 I love the simplicity and ease of use of this curriculum! The letters are simple, yet beautiful. With daily work being only half a sheet, my children do not feel overwhelmed. I also love having it digitally. 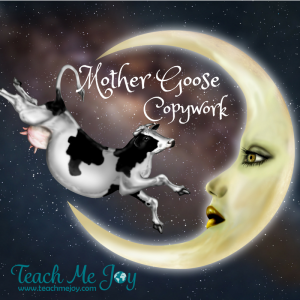 I can print and re-print for multiple children without the hassle of copying or saving an original. Perfect for my needs! 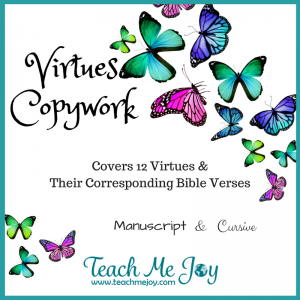 Virtues Copywork – The Joy of Copywork!